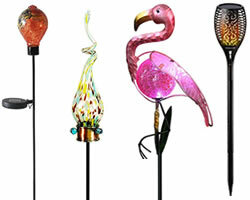 Light lasts 8 to 12 hours if positioned in full sun. 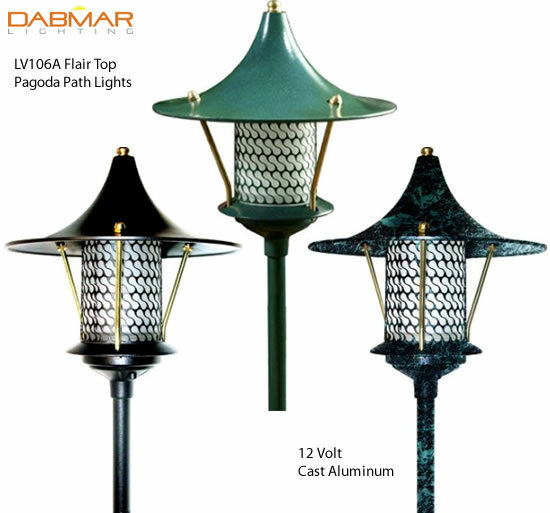 Very easy to use and durable, no wires. Just lift and move to mow! Looks great day and night! 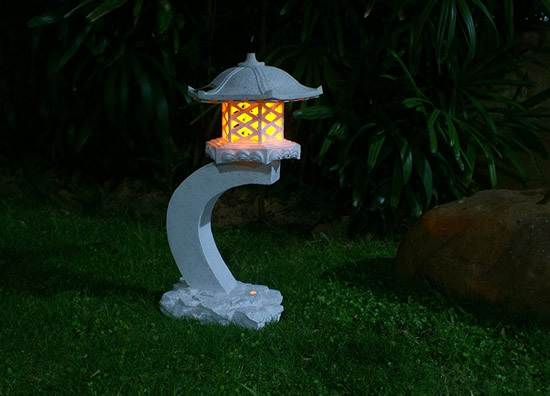 Warm LED gives an real lantern look. 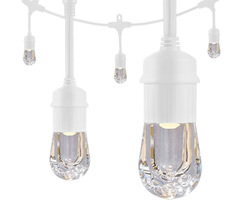 Dimensions: 24" x 10.7" x 14"
1 LED light cluster with 6 white bulbs. Very easy to set up. Require no plumbing. 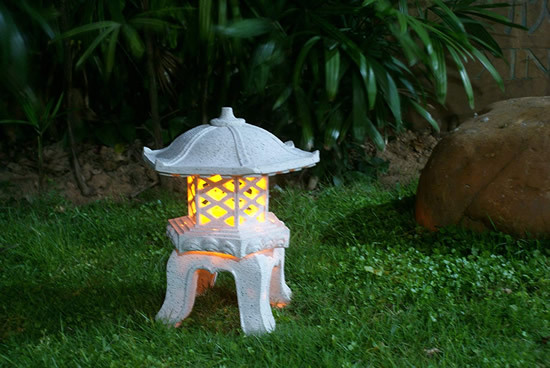 Just assemble, fill with water and plug into a standard electrical outlet. Holds approximately 3 gallons of water. 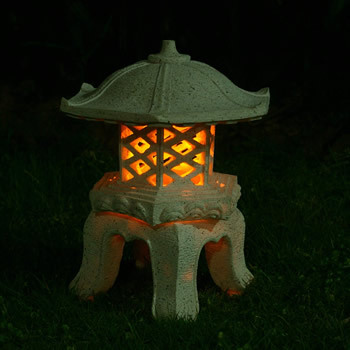 In Japanese architecture a Moksha is the decorative roof or "skirt story" that has been built up over the true roof. 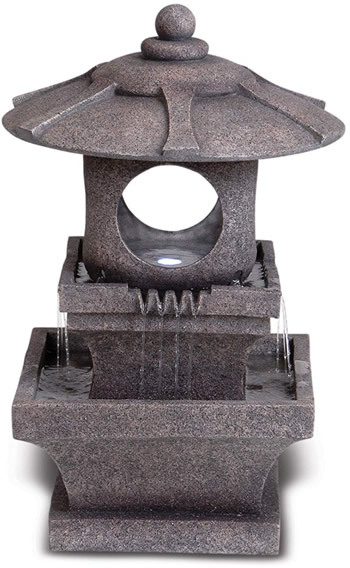 Perfect for a quiet corner or a Zen garden, the Mokoshi Pagoda Fountain features a radiant LED illuminated toshin core as water cascades down from all four sides creating a peaceful in-home oasis and meditative atmosphere. 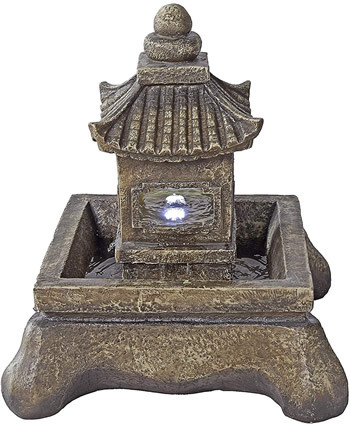 To be admired day or night, you can enjoy this sculptural Design Toscano fountain anywhere, from modern wood deck to an Asian ornamental garden. 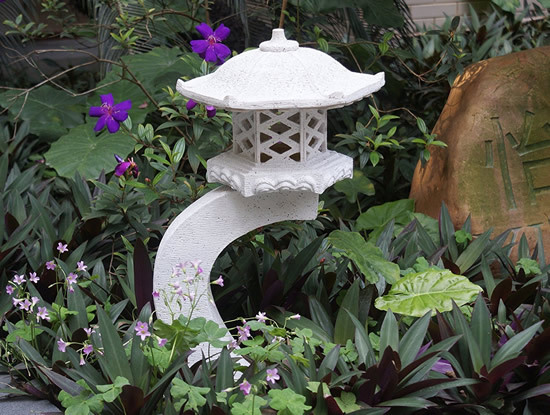 Cast in quality designer resin and hand-finished to replicate weathered gray stone, this investment in garden art features an integrated, UL-listed, indoor/outdoor pump that brings the soothing sound of trickling water to your home. Easy to set up. Require no plumbing. 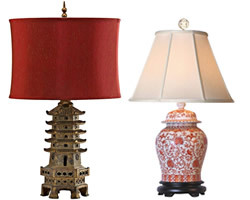 Fill with water and plug into a standard electrical outlet. 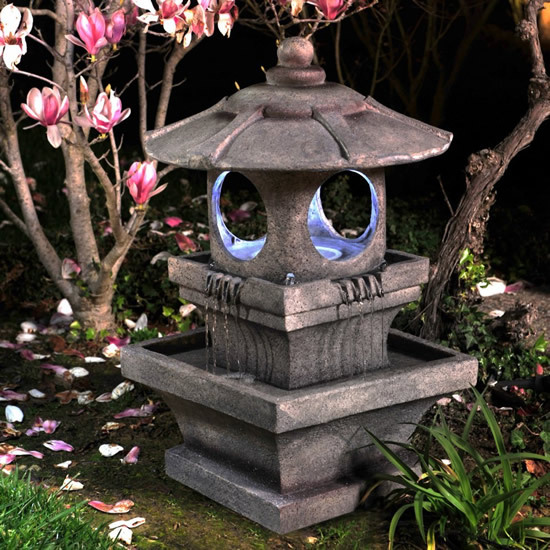 Bring peace, beauty, and harmony to your outdoors and transform your flower garden into an oasis with this lighted fountain. 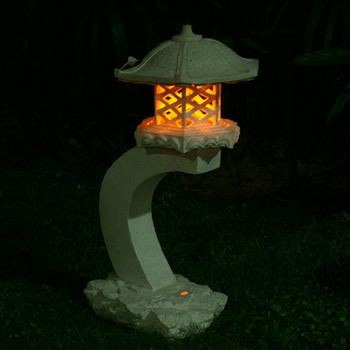 Beautifully constructed, this peaceful garden fountain brings the soothing sound of natural flowing water to your environment as well as a soft and subtle glow. 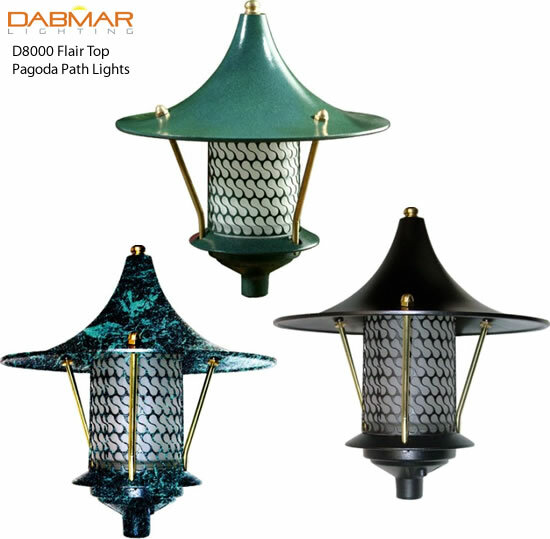 Its stunning Asian-influenced design blends traditional shapes with trickling water and soft illumination for a powerfully soothing effect. 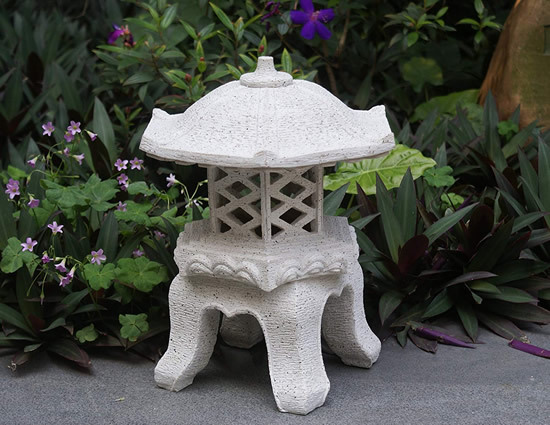 Made from weather-resistant and lightweight resin, this fountain is designed to look like stone without the weight. Lightweight and easy to move, clean and mow around. 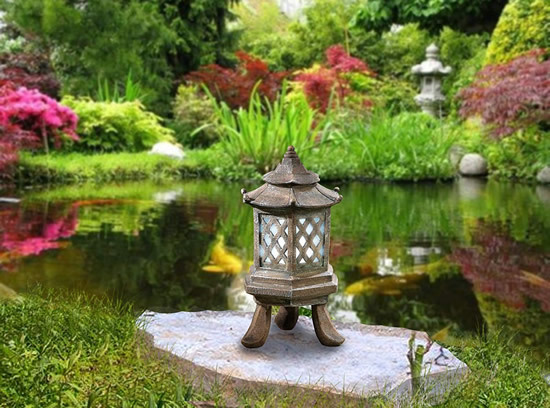 Convenient as well as beautiful, simply plug in the fountain's pump, fill the basin with water, and let nature take its course. 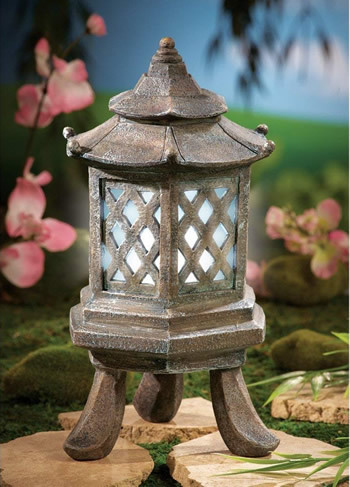 The hidden light within plus the natural music of bubbling water will transport you to another realm. 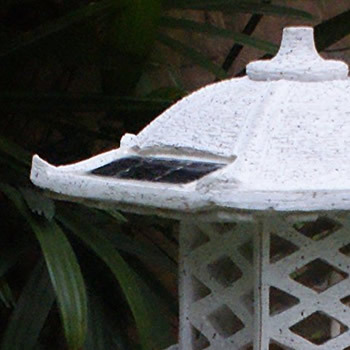 Place in a location that gets sun. 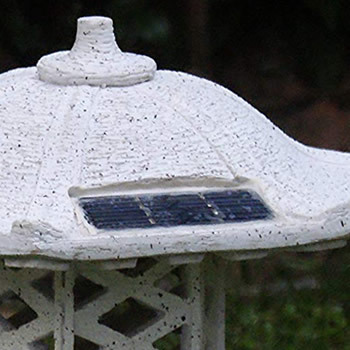 Light will glow at dusk after solar panel has charged batteries, included.